Helveg's target is to popularize the vegan life style, to make it well known in the city and romandie. to make this new life style and consumption trendy. So that Geneva citizens can adopt this new form of ethical and ecological consumption like many international cities have already done. In 2011 Helveg's project is implemented,starting from an idea "to be in harmony with oneself, the big theories and good ideas are not enough --> you must act ". The vegan word was completely unknown in Geneva (slang? cult? strange?... 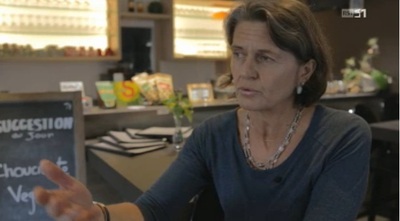 ),Helveg's founder remained strong and explain the concept to her official interlocutors (bank, notary, administration offices...)what it means without animal products. No desire to convert, only with a seductive strategy, everything has to be delicious and beautiful, citizens have to delect. Helveg launched the first vegan resto-boutique in romandie with an online shop and individual coaching and consulting service. Since then, the word "vegan" is widely known in Geneva, some restaurants are following the trend and are taking care of the vegan customers by developing vegan choice. Some Chefs were inspired to boost their creativity. Vegan customers who never used to go out discovered the pleasure of going to a restaurant. Small "macrobiotic vegetarian" restaurant dare to use the word "vegan" making it less sad and more trendy. Helveg welcomes vegan concept in the city.